In August 2011, Simon Langan joined the International Water Management Institute as Senior Researcher and Head of Office for the Nile Basin and East Africa. In this role, he quickly took advantage of an opportunity to visit Jeldu, one of the Nile BDC sites. In September 2010 he took part in the Nile BDC stakeholder launch meeting. He was particularly taken by a number of aspects, one of them being the establishment of ‘Innovation Platforms’. He also visited the project site at Jeldu – where one of these innovative platforms was being established. 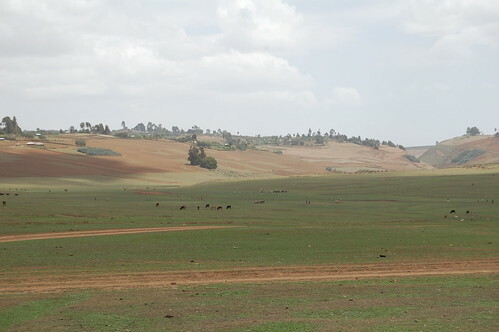 The landscape he witnessed was very dry with hill slopes supporting a mixture of root crops and cereals and the lower slopes dominated by poor looking pastures grazed at medium stocking densities. Two weeks ago in August 2011, he revisited Jeldu to see progress. The weather was different – very wet; and his view was very different – it was the end of his first week at IWMI! In May the landscape was dry, with some scorched and bare soil and poor pasture on the lower slopes. 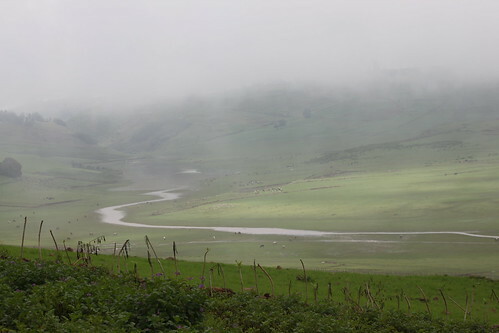 By August, the rains had come and a photo of about the same part of the landscape shows a green landscape with a river flowing across the plain. What he essentially picked up from the visit was how it may be possible to use different elements of the landscape to harvest and store water at the landscape scale. The second part of the visit was to check that the monitoring equipment was working and collecting data. The data collected will allow us to characterize aspects of the hydrological cycle as rainfall input, sub-surface water levels and river flows. The aim is to have good baseline information before interventions are devised. Continued spatial and temporal data collection will also allow an assessment of where and how effective the interventions have been. As part of this monitoring local farmers and members of the community are involved in reading the data an input to helping raise awareness and capacity.